"Autism Awareness Personal Checks" product is already in your cart. We Walk or Autism, wear the Autism Ribbon, and now you can bring support and awareness with each check you write. 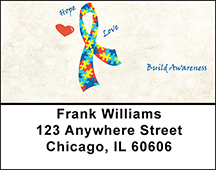 Consider matching Autism Awareness Address Labels and a coordinating Checkbook cover to complete your order today.